Catherin Edmondston, a prominent North Carolinian who was 41-years-old when Union general William Sherman and his men marched through North Carolina in 1865, wrote the account from her home in Halifax County, North Carolina on March 21, 1865. Edmondston discussed, in this particular writing, the movement of Sherman and his men on their way to Goldsboro, with a discussion of a battle at Averasboro. Although worried about Sherman, and what his men would do, as they were â€œmurderous scoundrels,â€ Edmondstonâ€™s belief in the Confederacy was not shaken. Edmondston had complete faith that Confederate General Joseph Johnston would defeat Sherman and victory would belong to the Confederacy. Even with the threat of Sherman and his army looming near, Edmondstonâ€™s faith in the Confederacy was not altered. In a sense, the fear that Sherman created, caused some women in the South like Edmondston, to reiterate he support for the Confederacy and a need for victory. 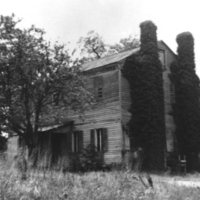 The main photo is of Hascosea, the plantation property of Edmondston in Halifax, North Carolina. Diary of Catherine D. Edmondston, March 21, 1865, Journal of a Secesh Lady: The Diary of Catherine Ann Devereux Edmondston, eds. Beth Crabtree and James Patton (Raleigh, North Carolina: Division of Archives and History , 1979), 681-682. Brother writes from Raleigh that Sherman effected a junction with Schofield at Elizabethtown in Bladen county, that on Friday there was a sharp fight a Black River (which divides Sampson from Cumberland) without decisive result. He is most despondent as to the result, says Johnston can only with the force he has delay Sherman, that in a few days Raleigh will be occupied! He will be forced to leave as otherwise he would be a prisoner in the hands of the enemy, but his family will remain & run the risk of the treatment they will receive from these murderous scoundrels. I hope for better things. Johnston will defeat Sherman, perhaps kill him or shoot off his other leg & compel him to retreat& we will be saved the miseries of having our whole country overrun by these bloodthirsty harpies. Johnston I am confident will be victorious, yet nevertheless, we live in a state of anxious excitement pitiable to witness. Catherine D. Edmondston, Diary of Catherine D. Edmondston, March 21, 1865, Civil War Era NC, accessed April 24, 2019, https://cwnc.omeka.chass.ncsu.edu/items/show/176.